Here's what I got from Melbourne... don't laugh but I only got 2 things :) (makeup wise, i bought other things but it's not Excellentmakeup appropriate). 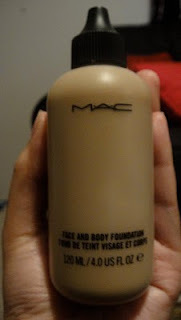 MAC Face and Body foundation - this is only sold in MAC Pro stores and online. I could have bought it online but I didn't know what my colour is. I am C5 (suitable for NC40-42). My skin is behaving well because of the cold so I really want to see how this baby performs in humidity. I am heading to a tropical place in a few months and I do hope this is coming with me happily. Kiehl's Abyssine Eye Cream - I've wanted this for so long but couldn't get myself to buying it! Anyway, so it's finally in my hands and I've been using it for just over a week as well so again watch this space for a proper review in a couple of weeks. First impression, I like the consistency, not too thick. However, I wish it was packaged differently.